Send $3 for full color catalog of paper dolls and paper goodies. Judy has illustrated dozens of paper doll books for B. Shackman and Dover Publishers, Shylling Toys and Paper Studio Press. Judy also writes for several national magazines and produces her own limited edition paper dolls. More recently, she has been busy restoring vintage paper dolls and selling them on her Papergoodies website. A founding member of OPDAG, Judy started the OPDAG Newsletter, as it was called then. She was chosen because she was the only one in the group who had a typewriter! The first issue came out in 1984 and was a two page letter! We've come a long way since then! Send long stamped self addressed envelope for list of paper dolls for sale. Cinderella Paper Doll Book by Brenda. With a degree in Fashion Illustration from the Art Institute of Ft. Lauderdale, Brenda works full time creating paper dolls, most with a vintage theme. She has also written articles on paper dolls and vintage clothing. Her articles and paper dolls have appeared in many national magazines. 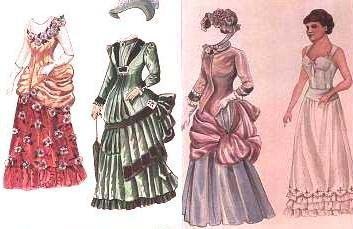 In 1993 Dover Publishing of New York published her first full color paper doll book, "Victorian Bride and Her Trousseau." She has since completed several more Dover books, and is working on a new title for Dover on Pin-Up Girls. Brenda also illustrates for Paper Studio Press, with her favorite topic, "Cinderella," as her first title. Upcoming projects include "The Changing Shape of Fashion," and "For the Love of Lace." Check out her web site for all the PDs she has for sale. With a lifelong interest in fashion, dolls and paper dolls, Sylvia has been collecting and drawing paper dolls for the past 20 years. Now retired from teaching art for 20 years in Lancaster, NY, she devotes more time to creating new paper dolls. Her paper doll subjects include fashion, portrait, children and dolls. After many years as a fashion illustrator and art director, Norma now focuses her creative efforts on paper dolls. Her specialty is antique clothing and it shows it her paper doll art. Her "Wardrobe" series, published by Hobby House Press includes paper doll sets from the Edwardian, Victorian and Art Deco periods. Her Colonial series paper dolls have been published in Contemporary Doll Collector and Miniature Collector. More recently, Norma Lu has been creating glamorous movie star paper dolls including Greta Garbo, Arlene Dahl and Rhonda Fleming. Paper doll books by Kwei-lin for Dover Publications. Kwei-lin often uses computer vector drawing programs because of their precision and their speed in making patterns. Recent works include "Cinderella Dreams," a 22-page paper doll book with text and illustrations, and MOD POP, a tribute to popular culture of the mid-1960's. She also turns to organic hand-drawn imagery in her cut-out sets of the fictitious Kingdom of Protoplasmia and "The Five Fairy Group." Kwei-lin sees her artmaking as a nonlinear journey through ever-changing challenges, a process that fosters invention. Kwei-lin is now creating paper dolls for Dover Publishing. Her current titles are "Day of the Dead" and "Voodoo". Jenny paper doll by David Wolfe. Jenny began publishing OPDAG News in 1991. She was handed the job by her mother, Judy M. Johnson, who published the newsletter from OPDAG's beginning in 1984. Assisting Marilyn Henry, Jenny also publishes a sister publication, Paperdoll Review, a magazine for paper doll collectors, and under the same name she manages a successful mail order and website business focusing on paper dolls. In 2005 Jenny started her own publishing company, Paper Studio Press, which has grown to a catalog of more than 60 paper doll books including vintage reproductions and new titles by paper doll artists today. We are pleased to welcome our newest editor, David Wolfe, to our editorial team. David comes from the fashion industry working as a fashion trend forecaster for the Doneger Group of New York. A former fashion illustrator, David has turned his love of drawing to the art of paper dolls. With a great willingness to share articles, art and ideas, the future of OPDAG's Paper Doll Studio will be enriched by David's expertise. He also contributes to OPDAG's sister publication, Paperdoll Review, and has created numerous paper doll books for Paper Studio Press. Celebrating his love of classic movie stars and glamorous fashion, his titles include Marlene Dietrich, Doris Day, Debbie Reynolds, Carol Channing and the movie Grease.